Siemens is a global powerhouse positioned along the electrification value chain – from power generation, transmission and distribution to smart grid solutions and the efficient application of electrical energy – as well as in the areas of medical imaging and in-vitro diagnostics. Since 1908, Siemens has actively participated in Malaysia's dynamic, economic and social growth. Today, backed by its global network of innovation, it is one of the leading technology providers with comprehensive products and solutions for various markets in the Malaysian economy such as in Power & Gas, Power Generation, Energy Management, Building Technologies, Mobility, Digital Factory, Process Industries & Drives and Healthcare. Siemens' innovative and efficient products are enabling power and energy operators in Malaysia to succeed in increasingly complex technological and economic environments – particularly in areas of power generation and power transmission as well as oil and gas production. For example, by the year 2017, Malaysia will be home to 6 units of the world's largest and most efficient gas turbines, the SGT5-8000H gas turbines; being the first country to have installed the turbines in the ASEAN region. 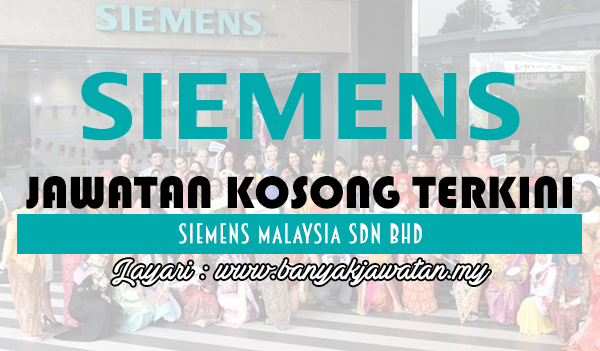 0 Response to "Jawatan Kosong di Siemens Malaysia Sdn Bhd - 18 March 2017"